In recent years, we have had academic visitors from Australia, China, Ireland, Japan, South Africa, and Switzerland, and the Faculty of English invites qualified senior scholars from overseas to be affiliated to the Faculty during a short period of leave spent in Cambridge. Contact us on visitors@english.cam.ac.uk if you have any general enquiries about becoming a academic visitor. Before applying, please ensure that you are aware of the facilities that are offered when securing academic visitor status. You will also need to check visa requirements and organise your accommodation if you are granted academic visitor status. Please do not apply to become an Academic Visitor more than 18 months before your planned arrival date in Cambridge. It is essential that you provide a letter of recommendation from your supervisor or Head of Department on your University's headed paper, stating the reasons why it would be helpful for you to spend time in Cambridge. For further details on what we do with your personal information please visit the University Information Compliance website here. Academic Visitors spend between three and a maximum of twelve months associated with the Faculty and pay a fee, currently £1,800 sterling, per year or £600 sterling per term. There are three teaching terms in each Academic Year. A deposit of £100 is payable two months in advance of arrival, with the balance payable either in advance by post or on arrival. If you wish to change the dates that you plan to be an Academic Visitor at the Faculty of English. You will be charged an additional administrative fee of £25.00, which you will be asked to pay at your induction. On 1 February 1988, Her Majesty's Government introduced a standard period of six months for which visitor status is granted on arrival in the United Kingdom. Visitors qualifying for the academic visitor concession (for whom work permits are accordingly not required) remain entitled to visitor status for up to 12 months. The Home Office will issue guidance to immigration officers to this effect. Such visitors should continue to claim the 12 months' concession on arrival, on the basis of written confirmation from their host institutions of the nature, duration and funding of their appointments. Visitors who receive only the six months concession on arrival may subsequently apply for its extension to 12 months. Please bear in mind that the cost of living and accommodation costs in Cambridge are expensive. The following are provided for official visitors to the Faculty of English – if you are affiliated with a college rather than the Faculty of English, your college will partly arrange these privileges. Membership of a college does not imply membership of the University. 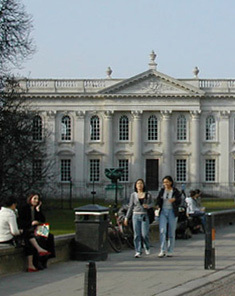 The College will normally apply for reading and/or borrowing rights at the University Library for its visiting members, if they are eligible for these rights.